Compatible with Internet Explorer (x86 and x64), and Mozilla Firefox (x86 and x64). Works in real-time to give you detailed page information, analyzes all webpages, even pages inside frames. ASP.NET ViewState Helper is completely free, now and forever! ViewState %: What percent of the total page size is being taken up by the ViewState? Markup %: What percent of the page consists of non-visible HTML markup? 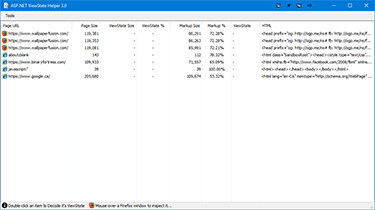 Download ASP.NET ViewState Helper right now, it's completely free! Download ASP.NET ViewState Helper today!